The distinction between precious and semi-precious gems is no longer apropos in the gem trade, since there are so many fine gems that are the equal of ruby, sapphire, diamond and emerald. 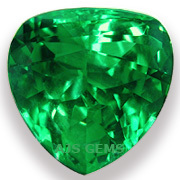 Indeed, many gem dealers now regard tsavorite garnet, not emerald, as the finest green gemstone in the world. Not to denigrate emerald, but there is certainly a case to be made for tsavorite, the chrome green garnet from East Africa. Where emerald tends to have many tiny internal fractures, tsavorite is much cleaner and more transparent. Emerald has traditionally been treated with oil to fill surface reaching fractures. More recently expoxy resins such as Opticon have become a routine treatment, repairing the stones but damaging emerald's reputation in the market. Tsavorite garnet, by contrast, is always completely untreated. The virtues of tsavorite garnet don't end there. In addition to its rich color, tsavorite has a much higher refractive index than emerald, and considerably more brilliance and sparkle. The only real downside to tsavorite is that it is many times rarer than emerald, and is mainly found in smaller sizes, usually well under 2 carats. High quality tsavorite is very difficult to find, and our stock had run low. But Arnold made a special effort to source fine tsavorite during his recent trip to East Africa, and he brought back some outstanding specimens. The rarest among them is a museum-quality 10.39 ct modified trillion from the Kabanga region of Tanzania (pictured above). This gem is not only exceptional in size, but in color as well. Larger tsavorites -- if you can find them -- tend to be dark and oversaturated. But some of the Kabanga tsavorites are wonderfully bright while still displaying excellent saturation. We are proud to add this exceptionally fine gem to our collection. A 10 carat tsavorite garnet of this quality is naturally an expensive gem. But we have also added some smaller tsavorites of equal quality that are more affordable. Any fine tsavorite over 2 carats will of course be costly, given their rarity. But you only have to compare the price of a high grade emerald of similar size to see that tsavorite garnet is very much a bargain in today's market. Tsavorites under two carats are still attractively priced, selling at prices similar to high quality sapphire. But thus far tsavorite has only been found in East Africa, in Tanzania and Kenya, so we expect it to remain a very rare stone. This month we feature new aquisitions to our collection. Click on any gem photo to see the detail page for that gem. Fine red gemstones are scarce and pricey, especially in larger sizes. This round red rubellite from Nigeria is perfectly sized for an impressive ring at over 11 mm in diameter. Round shapes are always hard to find in colored gems, since it takes more rough material to cut a round. See all our Rubellite Tourmaline. An exceptional large precious opal from Ethiopia, this impressive gem exceeds 25 x 20 mm. It displays remarkable play of color under both natural and articial light, with a full color range. This large opal will make a gorgeous pendant or a prized collectible. See all our Precious Opal. A lovely matching pair of aquamarine pears with excellent color saturation. You will rarely find aquamarines in this size with this deep blue color. Exceptionally clean, these fine aquas will make a gorgeous set of earrings that will please the most discerning buyer. See all our Fine Aquamarine. The US Federal Trade Commission is preparing to revise its Guides to the Jewelry Industry and is soliciting comments from the public on a range of topics. The issue at the top of the FTC's list is the marketing of lead-glass-filled rubies, sometimes referred to as "hybrid" or "composite" rubies. The FTC is concerned that many of these rubies are being sold without proper disclosure and, when the treatment is disclosed, that consumers are not aware of aware of the special care required. We have advised buyers to avoid glass-filled rubies, and recommend that buyers be very careful in buying low-quality ruby. Many buyers are not aware that that these fracture-filled rubies can easily be ruined by heat or household chemicals. Congratulations on your engagement! Colored gems have become very popular for engagement rings, but it's important to choose carefully. The top choices are sapphire and ruby, since they are the hardest and most durable of colored gems. Other suitable choices include spinel, alexandrite, imperial topaz and the finer garnets. When the new Ethopian opal came on the market, we were impressed by its remarkable play of color, as well as the attractive prices. But we had questions too about the stability of this material, which has hydrophane properties (meaning it absorbs water). But thus far our experience has been very positive. According to a recent study in the GIA journal Gems and Gemology, the Wegal Tena opals from Ethiopia "are resistant to crazing, and are remarkably durable." However, because the hydrophane opal is quite porous, we recommend avoiding exposure to chemicals or cosmetics. Opal in general requires care, and the Ethiopian opals are no exception.